The iPhone madness is currently ongoing, evident in the amount of iPhone 6s Plus units have been pushed out by Apple – it’s just absurd at how it’s being gobbled up by the masses. LG, on the other hand, just announced its prized phone for the fall season, the V10, which packs a wallop with its specs sheet and unique features. Many phones have tried desperately to minimize Apple’s onslaught, but can LG’s latest and greatest do a thing to mitigate it? Their designs are complete contrasts to one another, seeing that the iPhone 6s Plus continues forward with its premium materials, svelte construction, and iconic looks. With this year’s model, they’ve introduced a new rose gold color option, but the phone actually sports a heavier frame than before – so it’s something you won’t want to drop, especially onto the hard pavement. And that’s where the LG V10 answers back with a solid response, seeing that it addresses the fragility that accompanies the iPhone 6s Plus’ premium package. Boasting a Dura Guard cladded body, further strengthened by 316L stainless steel guard on its sides, the V10 ensures it’s well protected against shocks and drops – while also offering a bit more grip in the process. Indeed, it’s not as premium looking or feeling in comparison to Apple’s offering, but regardless, some folks will appreciate the peace of mind that accompanies its design. On the specs front, there’s no doubt an advantage with the V10, since it’s graced with a 5.7-inch 1440 x 2560 (Quad-HD) IPS Quantum display. As for Apple’s pride and joy, it’s still sticking with a 5.5-inch 1080 x 1920 Retina display, so it doesn’t achieve the same crispy detail level of the V10’s display. Regardless, it has one killer feature – and that’s 3D Touch, which adds a totally new element to the experience. Capable of measuring small pressure changes to the panel, it provides for an inventive, new way of interacting with the phone. Therefore, we get a sense of depth, as pushing into the screen offers some useful functions. With the LG V10’s IPS Quantum display, however, which is similar to the G4, we can’t help but notice some AMOLED-like qualities with its package. At the highest brightness setting, it produces an iridescent glow that gives colors a ton of liveliness. Additionally, it manages to do nicely in reproducing that true black color. There’s also a smaller sized secondary screen tucked into the upper right corner of the panel. Its purpose is mostly related to eliminating the need to constantly turn on the screen to check out the time and date, and when it’s powered on, it’s used to multi-task between apps and offer some additional functions in certain apps. Apple’s latest iOS 9 experience might not bring forth any dramatic changes, 3D Touch features aside, but it still pay tribute to the fundamental characteristics of being simple, responsive, and straightforward. While it’s easy to get situated for some users, it still continues to lack the higher degree of multi-tasking we get in LG’s customized experience running on the V10. From its multi-tasking prowess, to its one-handed mode, LG’s custom Android experience really cater to a wide range of folks. 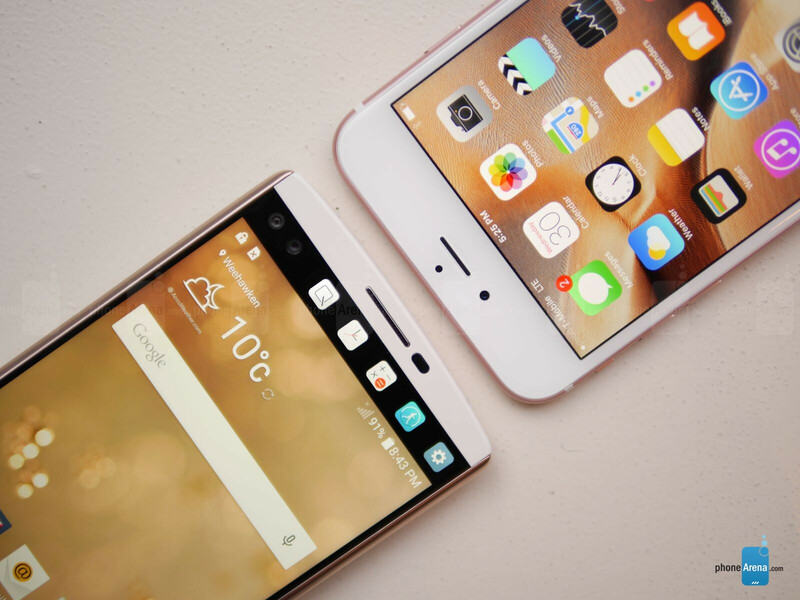 Superficially, the two handsets provide the necessary power punch to handle all the basic and trivial tasks. 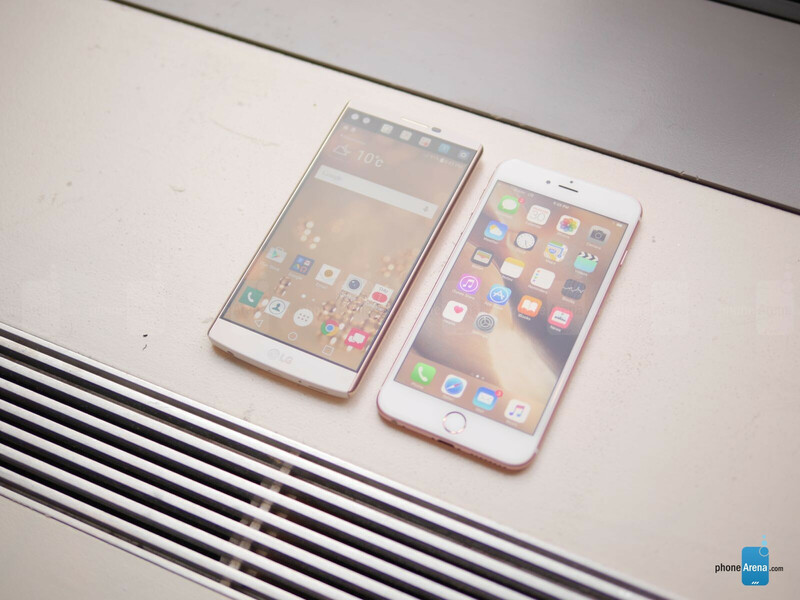 The iPhone 6s Plus is propelled by Apple’s new dual-core A9 chipset with 2GB of RAM, which has shown to be excellent in handling graphics processing as well. On the flip side, the LG V10 is powered by the same processor used by the G4 already – a hexacore Qualcomm Snapdragon 808 SoC coupled with 4GB of RAM as well. While it’s accompanied with smooth responses navigating through the interface, we’re curious to see how it yields in the graphics side. Not surprisingly, the iPhone 6s Plus can be picked up in either 16GB, 64GB, or 128GB capacities, but there’s no room for expansion whatsoever. Well, LG addresses that because not only does it come stock with a generous 64GB of storage, but there's also a microSD card slot in tow for expansion. 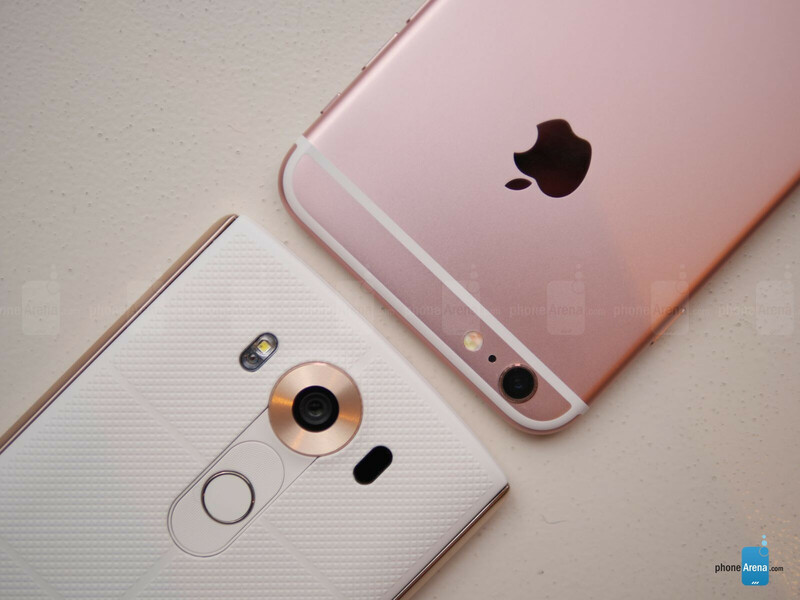 The iPhone 6s Plus’ 12-megapixel camera with an f/2.2 aperture lens has proven to be quite exquisite when it comes to capturing all sorts of footage, but if the LG G4 is any indication, we can expect the same, if not better results with the V10. And why’s that? For starters, it’s fashioned with a 16-megapixel snapper with a slightly better f/1.8 aperture lens, but what really sets it apart is the fact that it offers true video manual control – something that’s unavailable with the iPhone 6s Plus. Adding to its arsenal, the V10 comes with two front-facing 5-megapixel cameras – whereas there’s only a single 5-megapixel snapper with the iPhone 6s Plus. This tandem of sorts enables the V10 to capture a wider field of view with its front-facing cameras, so you’ll never need to use a selfie stick again. Apple really has nothing to prove at this point, as sales for the handset is all the indication we need to figure out its overall success. There’s a reason why it’s always a constant contender, seeing that it’s the kind of phone that’s simple to operate, sports a premium design, and just super responsive in whatever it does. 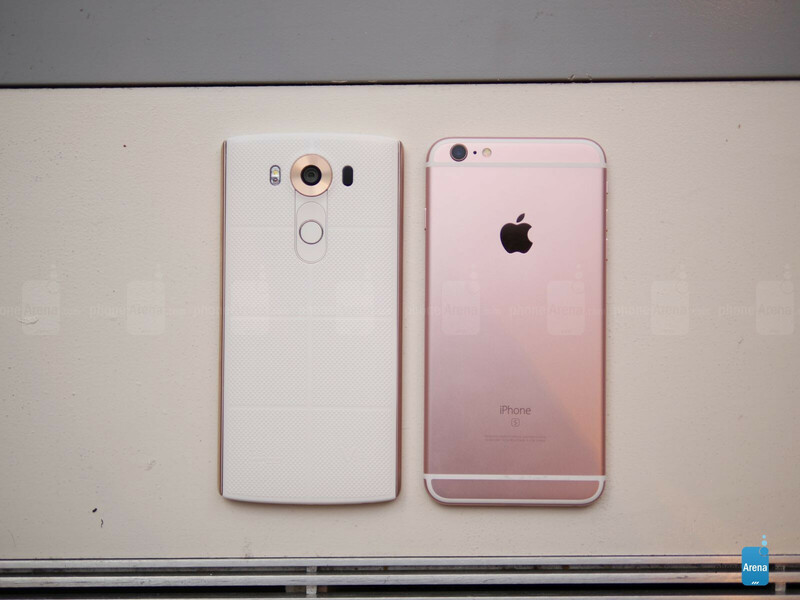 LG, meanwhile, has a huge opportunity with the V10. Looking at the overall package, it surely has an impressive tally that can’t be overlooked. Not only is it outstanding with its impressive specs sheet, but it’s attached with some cool and unique features that we don’t normally see in other phones. And best of all, its camera experience is already getting us anxious about checking it out. 6s Plus Wins. The Second Display Is Kind Of Cool But I Don't Like Just Like The Galaxy Edge Devices It just Seems Useless. I'll be honest, the V10 actually looks a lot better in the flesh than I initially thought it would. Two things still throw me off. The always on screen seems to stick out like a sore thumb. Like you said, seems a bit useless too, ala the edge devices. And two, those side bars, they seems as though they were just tacked on. SMH. Still held its own next to the very attractive looking iPhone. If lg just tunes its software right for secondary display then I would definetly look forward it. 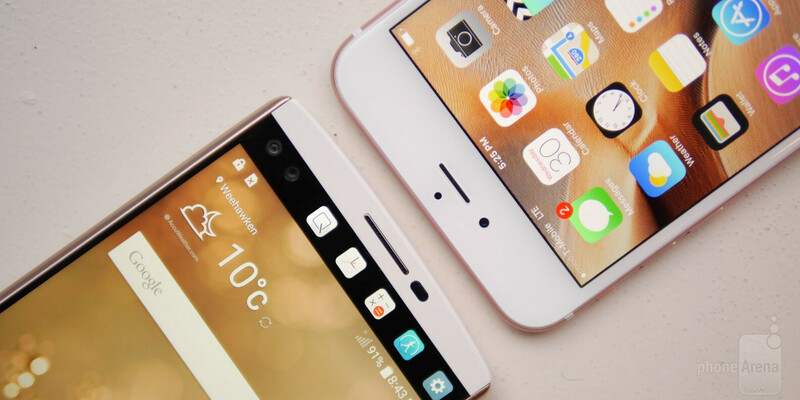 The LG looks the better designed of the two, from the front, the bezels are much smaller, the size much the same, yet the iPhone houses a smaller screen. From the back the ugly plastic lines and offset and protruding camera is no match for the cleaner more balanced LG. For me the Rose pink is kind of sickly too. the iPhone has a "slightly better" lens with regards to the 2.2 aperture versus the V10's 1.8?! The difference between the two is an amazing 65% more light hitting the image sensor of the V10 than the iPhone 6S Plus! Get a clue PA! Fred Flintstone would laugh at those iPhone bezels. If the phone's signal/reception seriously affected by thin bezel then i will let it go. I love people who can see just " I " in front and think there is nothing better in the world.Like Iphone - from previous generations(3,4)- specs like others get 1 or 2 gen before,innovations - they taking solutions or using hardware from others,poor specs + nothing to customized and you have to pay for phone and everything"I" more than the others want..Because of fantastic marketing they will sell you even sh..t and tells there is a chocolate and fanatics will go for it .People will stay in ques long hours before they opened shop to buy new "I" ..... - that's not normal.Apple will make a lot of money on anything they want to sell - even if you can find (easily !!!) a cheaper and much better thing on the market.They avoid taxes,make idiots from customers and they believe them whatever they say.I really like new Iphone 6s+ - thats the first Iphone witch keep the same level with other manufactures but I will go for LG v10 -simply looks even better than "premium" look Iphone - for me.